Meet some of our pets and clients! Kobie came to us as a 6 month old pup from a foster home after being rescued from a kill shelter. His unique colors and markings and his unique personality made a lot more sense once we did a doggy DNA test to get an idea of his ancestry. With the quirkiness of a husky and the food drive of a lab, he makes an excellent test pup for tricks and behavior modifications! He keeps us busy and entertained! Blaze is a very independent cat and always finds a way to keep herself entertained. In this case, by bothering some fish that are annoyingly inside a glass box! 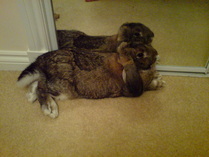 Rabbits make incredibly good house pets and Chunk is one of the best! He keeps himself busy finding new things to do with cardboard boxes (usually involving chewing them) to pass the time until his next healthy snack arrives! 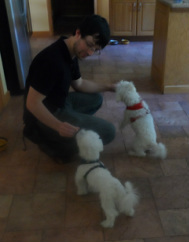 Cocoa (red harness) and Lolo (blue harness) look alike but are two very different dogs inside! Lolo struggles with high level fear and anxiety whereas Cocoa wants everyone to know he is the big dog, come near his turf at your own peril! Their loving owners and I worked together to help these very different dogs learn the same lesson...people aren't so bad after all. Maddy mastered her basic cues quickly, our biggest challenges were keeping her focused during loose leash walking and finding new ways to burn some of that golden-doodle puppy energy! As you can see, her owners got her to sit still long enough to take a lovely photo! 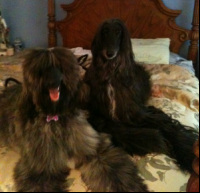 Afghan hounds are notorious for being...lets say.....a little difficult to train! Tristan and Isabella are no exception and definitely keep their pet-parents on their toes! They continue to make great progress in their general obedience and behavior, we get regular updates on their latest adventures!